What we hardly ever see in articles on North Korea is the human side, some of the faces among the 25 million people at risk of being murdered or maimed by an American-led attack. I was part of a small delegation that visited the DPRK, with the intent of hearing from Koreans themselves about their country and history. 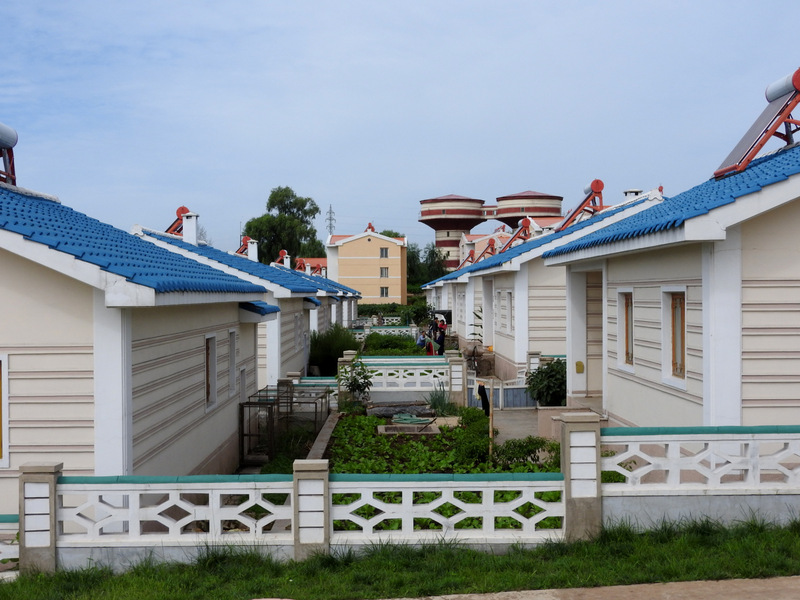 PYONGYANG, NORTH KOREA — North Korea (the Democratic People’s Republic of Korea, or DPRK) is one of the least understood and most lied about countries on Earth. In Western corporate media renditions, most news about the country is alarmist (of “the North Koreans want to kill you” type), fake (“all men have to have the same haircut,” a story originating from Washington itself), or about the North’s military. On September 19, 2017, in the forum of the United Nations General Assembly, U.S. President Donald Trump vowed to “totally destroy” North Korea. This is not the first time threats against the DPRK have been issued. Colin Powell in 1995 threatened to turn North Korea into “a charcoal briquette” and in 2013 reiterated that threat to “destroy” the country. Not broadcast in corporate media is the fact that America had already annihilated North Korea, destroying the capital city, Pyongyang, and cities around the country, with 635,000 tons of bombs, including 32,557 tons of Napalm — indeed turning the North into a ‘charcoal briquette’. The absurdly cartoonish “news” one hears in Western media about North Korea is meant to detract from America’s past and current crimes against the Korean people, and to garner support for yet another American-led slaughter of innocent people. We are meant to believe that the North Korean leader is a maniac, inexplicably hell-bent on bombing America. Utterly deleted from the story is the fact that North Koreans have a different perspective: the right to a deterrent against yet another U.S. annihilation of their country. The right to self-defense. The United States is the country that first produced nuclear weapons and the only country that actually used them, massacring hundreds of thousands of innocent civilians. It is the U.S. that threatened to use nuclear weapons against the DPRK during the Korean war in the 1950s, and first introduced nuclear weapons into the Korean peninsula after the war. Propaganda and history aside, what we hardly ever see in articles on North Korea is the human side, some of the faces among the 25 million people at risk of being murdered or maimed by an American-led attack. From August 24 to 31, 2017, I was part of a three-person delegation that independently visited the DPRK, with the intent of hearing from Koreans themselves about their country and history. As it turned out, we heard also about their wishes for reunification with the South, their past efforts towards that goal, their desire for peace, but their refusal to be destroyed again. Following are snapshots and videos from my week in the country, with an effort to show the people and some of the impressive infrastructure and developments that corporate media almost certainly will never show. My visit coincided with the impending U.S. travel ban to the DPRK, which came into effect one day after I left the country. This wording reveals that the intent of the ban is far more likely to prevent the American public from seeing the human face, and positive aspects, of the DPRK. 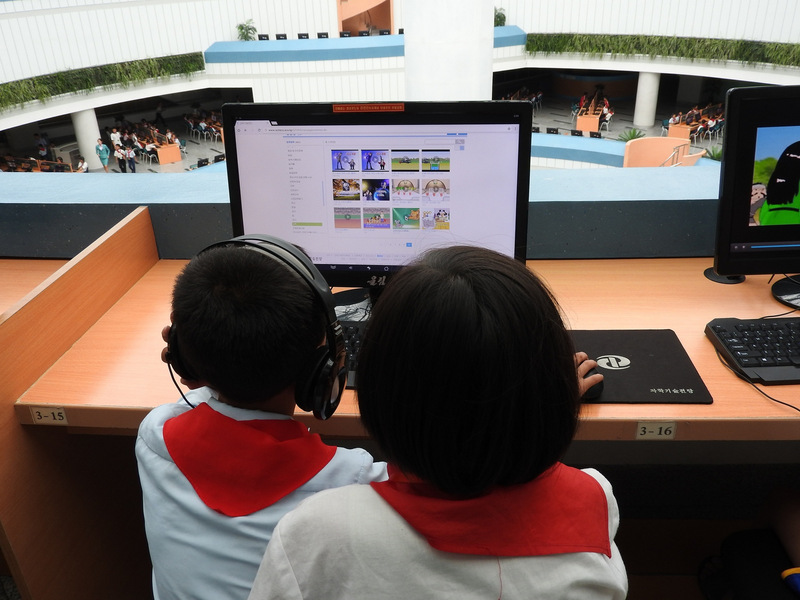 The Mangyongdae Children’s Palace in Pyongyang is a sprawling extra-curricular facility offering children lessons in sports, dance and music (Korean and non), foreign languages, science, computers, calligraphy and embroidery, and more. Around 5,000 children daily attend this facility. They may indeed be the most talented children in Pyongyang and surroundings, but encouraging the growth of talent is something done worldwide. 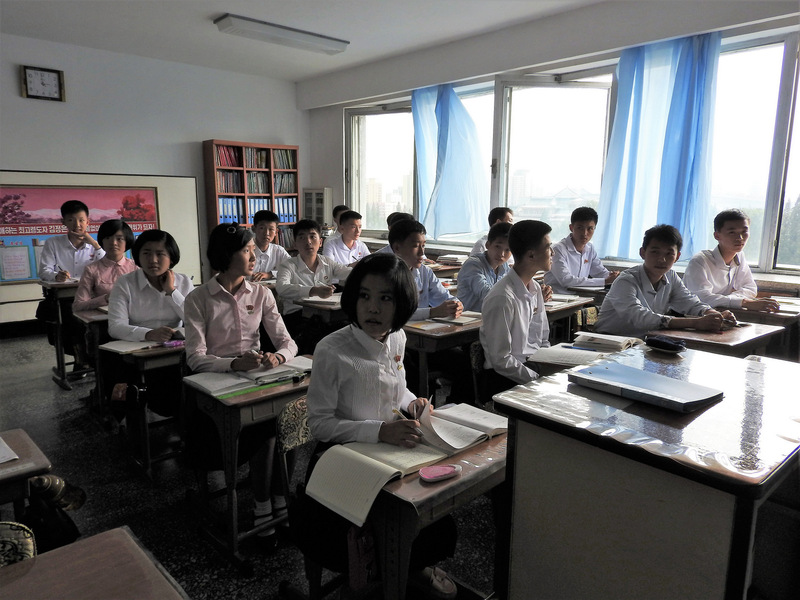 Unlike in many Western nations, in the DPRK lessons are free of charge. 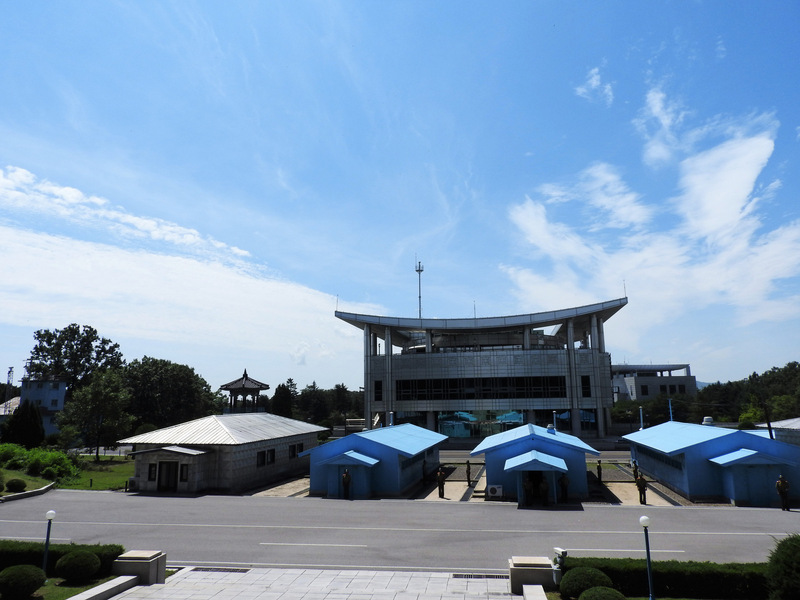 The Pyongyang International Football School opened in 2013. The complex includes a massive stadium and a school teaching all subjects, with football as a focus for the roughly 200 students. Different classes practiced their skills outside, doing warm-up drills to energetic music. When years ago I lived in Korea’s south, practicing Tae Kwan Do I warmed-up to similar drills. 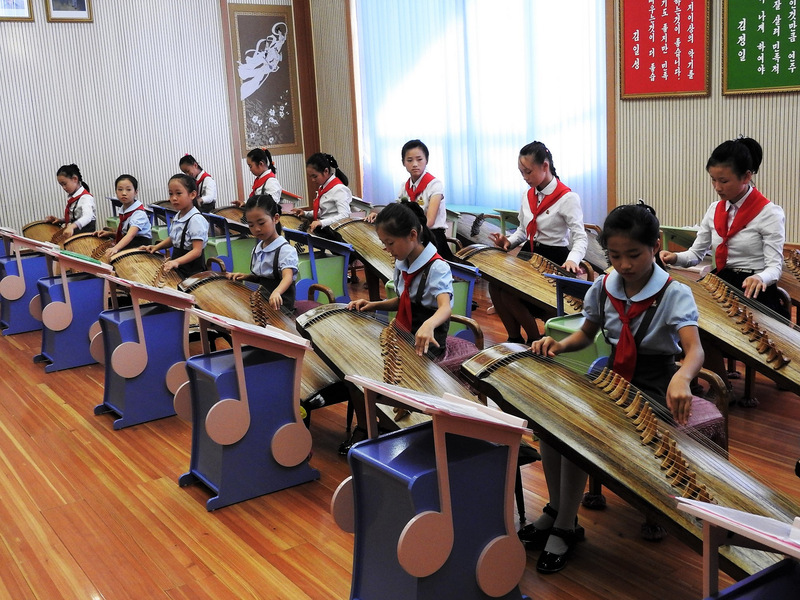 Students at the Mangyongdae Children’s Palace playing the traditional Korean instrument, the kayagun. Listen to their performance here. 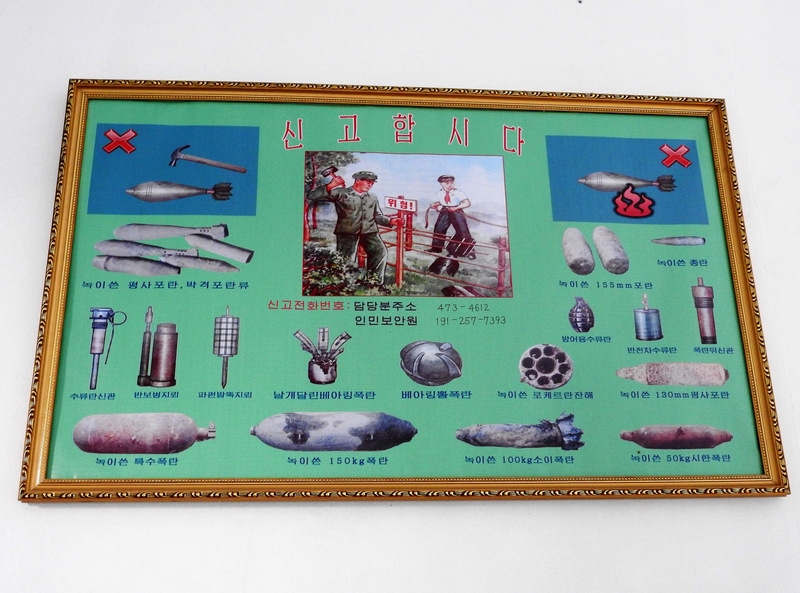 In a hallway in the Middle School, a poster encourages students to alert authorities if they come across unexploded ordnance (UXOs). Our host, Kim Song-Nam, said: “We’re still discovering old bombs, for example when we dig to lay the foundation for a building.” This article noted the discovery of nearly 400 UXOs near an elementary school playground, that farmers periodically come across UXOs, and that the cleanup period may take longer than 100 years. At the Pyongyang War Museum, we learned: “There were 400,000 people in Pyongyang, and they dropped more bombs than that on the city.” 428,000 bombs, according to the museum guide. 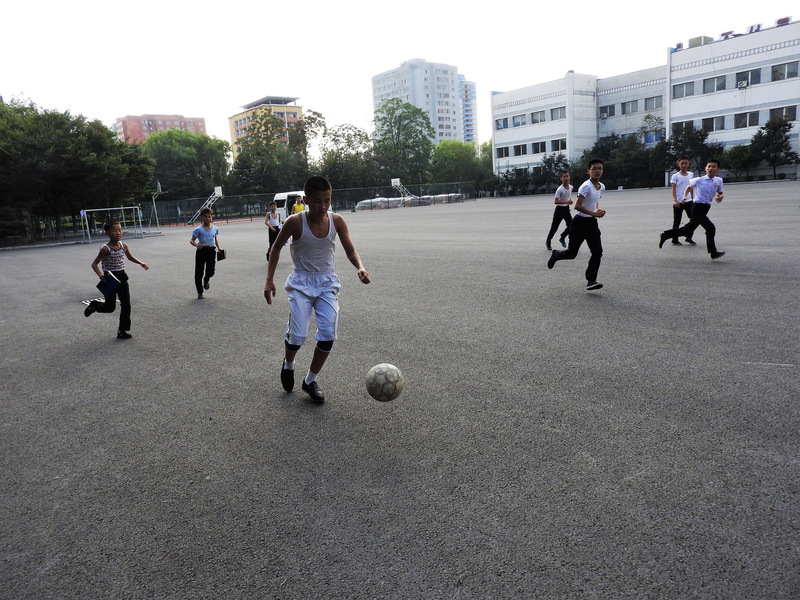 Students playing football outside the Middle School. Watch the clip here. Pyongyang’s Science and Technology Center, completed in 2015, is an expansive structure heated by geothermal energy, and with drip irrigation-watered live grass on inside walls. Its more than 3,000 computers are solar powered, the library has books in 12 foreign languages, and a long-distance learning program enables people from around the country to study and earn a degree equivalent to that of in-university studies. Watch a tour of the center. 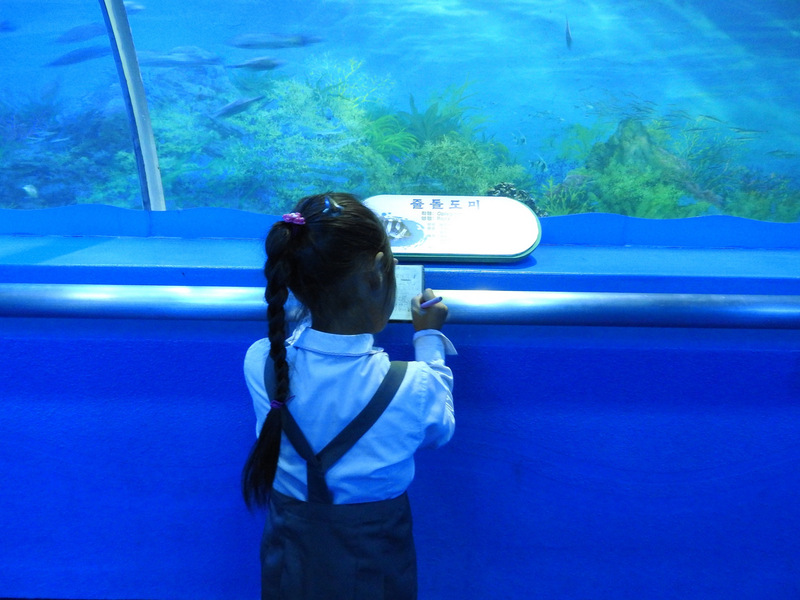 Student in the aquarium section of Pyongyang’s zoo. While the zoo was well-maintained, by far most interesting was watching the human interactions, from schoolchildren to adults. Koreans returned our smiles with deep, genuine smiles. Watch a clip from the zoo. 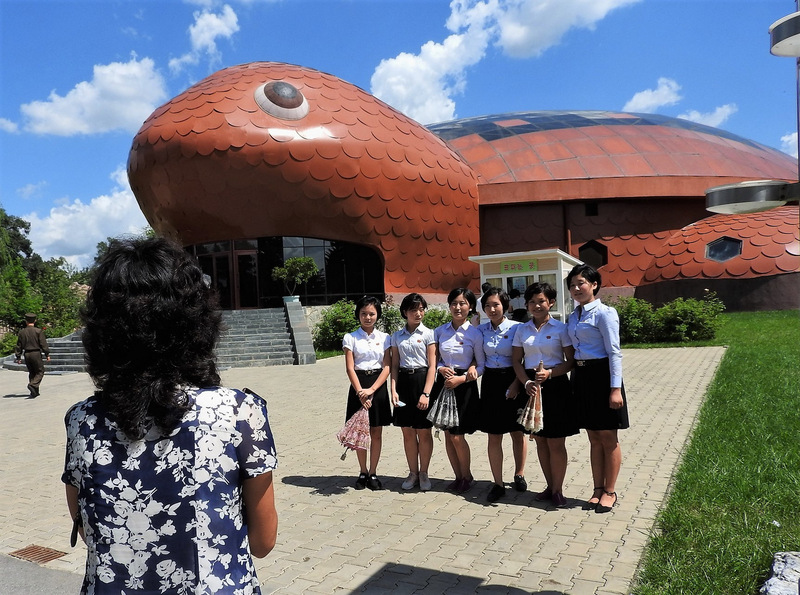 A group of schoolgirls pause for a portrait photo at Pyongyang’s zoo. Watch a clip from the zoo. 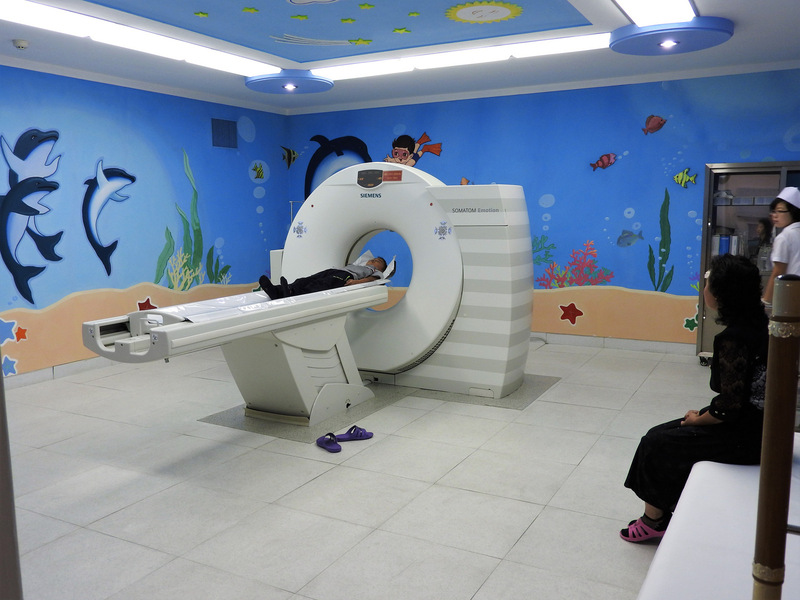 The Children’s Hospital provides classes to inpatient children to continue their studies while in hospital. 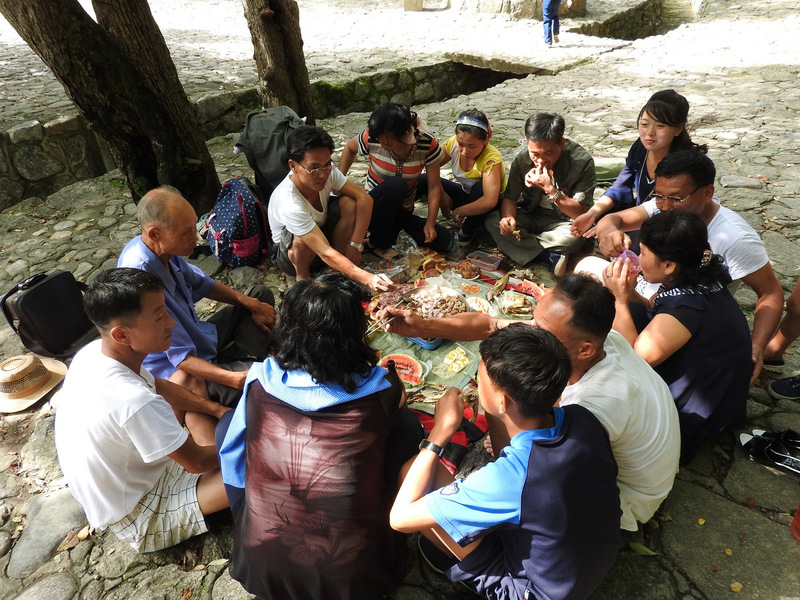 While walking up a path to the Pakyong Waterfall, over 100 km south of Pyongyang, I met a group of men and women grilling meat over a fire. At the waterfall, other picnickers ate grilled meat, fish, boiled eggs, kimbap (“Korean sushi”), and kimchi (fermented vegetables), drinking beer and soju (alcoholic drink). Having lived in South Korea, this scene is one I saw countless times along the sea or in the mountains. Watch clips here and here. Beneath a tree near the waterfall, soldiers took turns being photographed with the waterfall as a backdrop. Later, they repeated at the waterfall. Watch here. 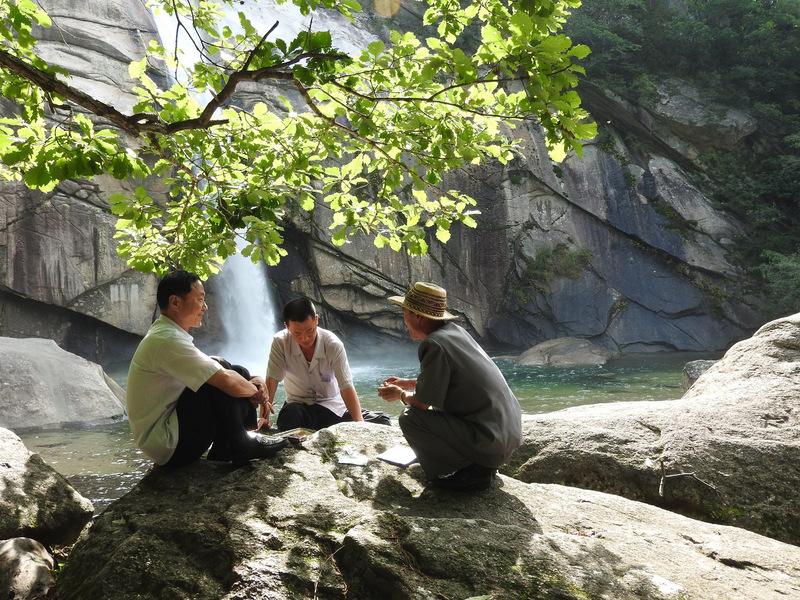 A group of men sit and chat near the base of the waterfall. 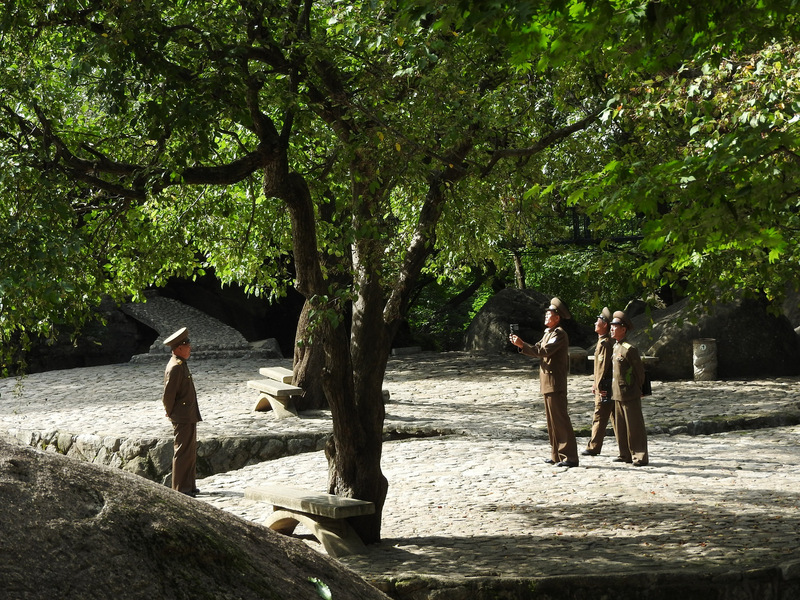 North Korea has suffered harsh periods of drought and starvation. The long-imposed brutal U.S. sanctions and destruction of the country don’t help matters. 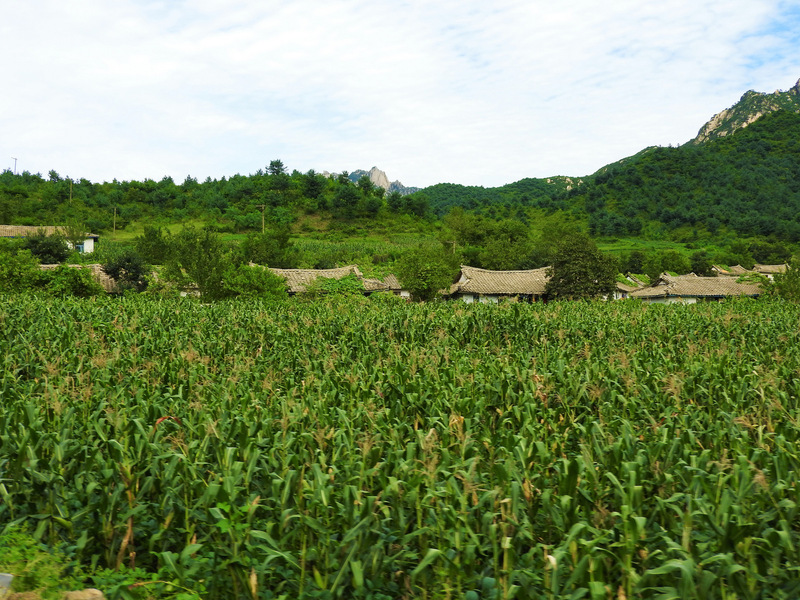 Yet, traveling over a hundred kilometers south from Pyongyang, we passed endless lush fields of corn and rice. 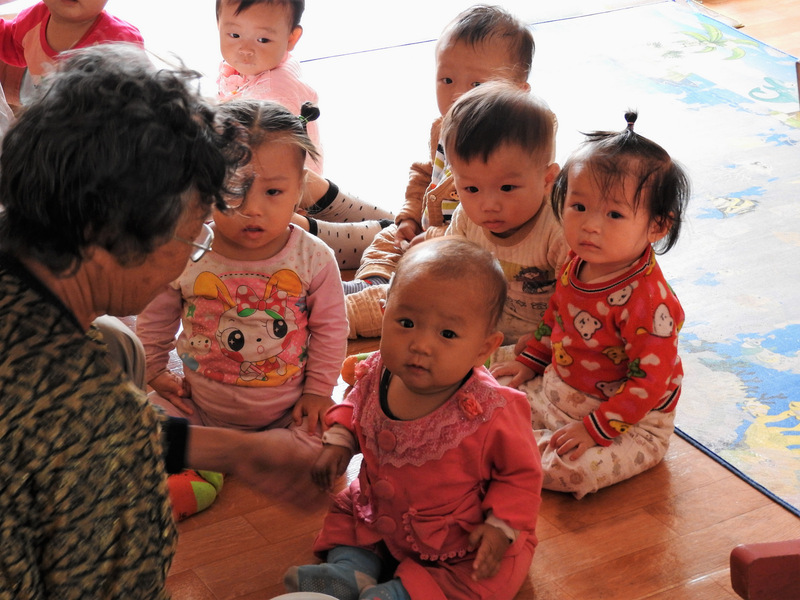 Inside the child-care center of the Jangchon Cooperative Farm. The cooperative also includes a cultural center for meetings and events, and rows of greenhouses. At the Kaeson Youth Amusement Park inside the city one night, I interacted with people and tried out some of the rides. The park was packed with families and children, including a group of 14-year-olds who had visited multiple times. 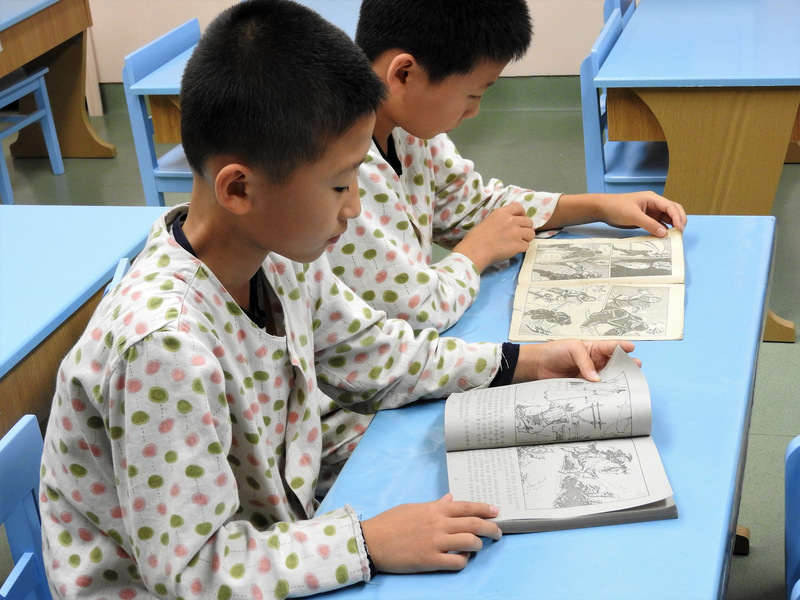 A schoolteacher from Nampo City said she frequently brings her students to visit. A young man next to me on one of the rides filmed with his mobile. 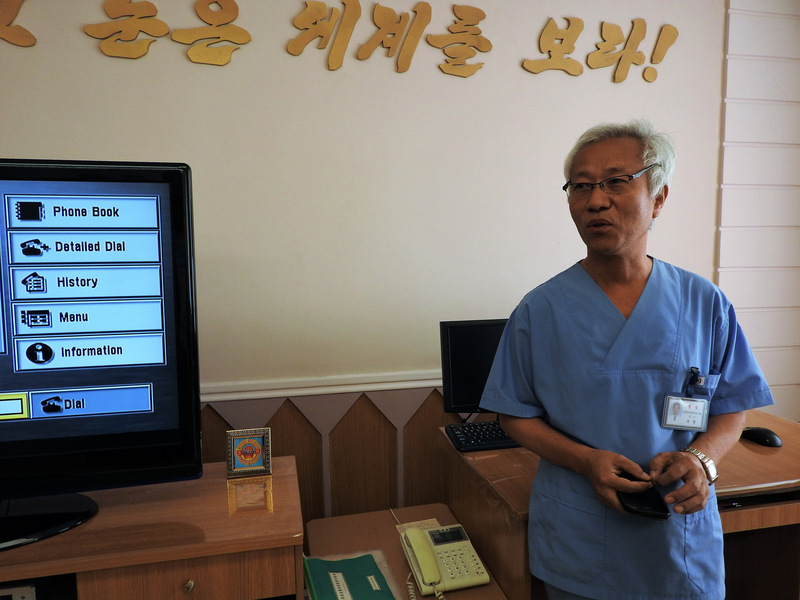 With an entrance fee of 200 North Korean Won (about US $0.22), the lines were long. 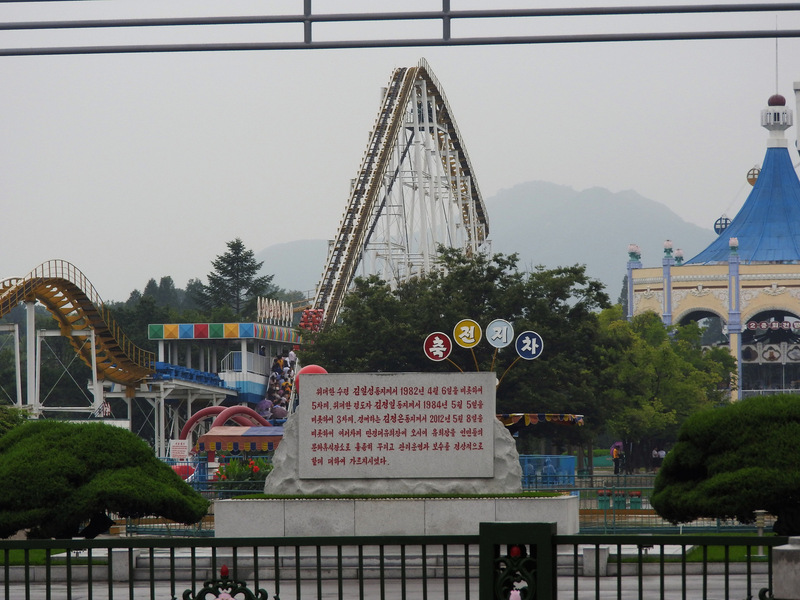 Photo: A second amusement Park outside of Pyongyang. 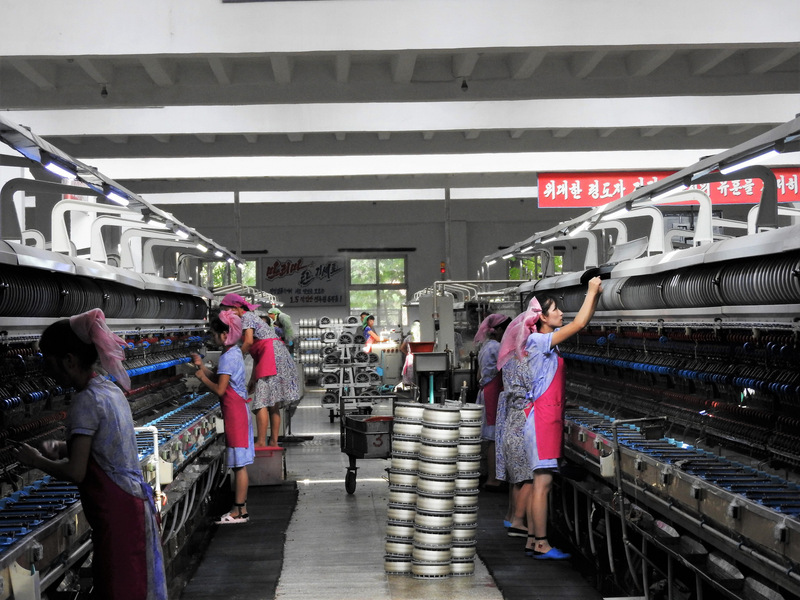 Under colonial Japanese rule, Pyongyang Silk Factory laborers worked in unsanitary conditions. When Korea gained independence, conditions were gradually modernized and improved. The present-day factory is clean and well lit, with water coolers throughout. The 1,600 workers work eight-hour shifts, with financial incentives to those who exceed their quotas. A nursery provides childcare, and unmarried women have accommodation on site, with a cafeteria and sports and leisure areas. 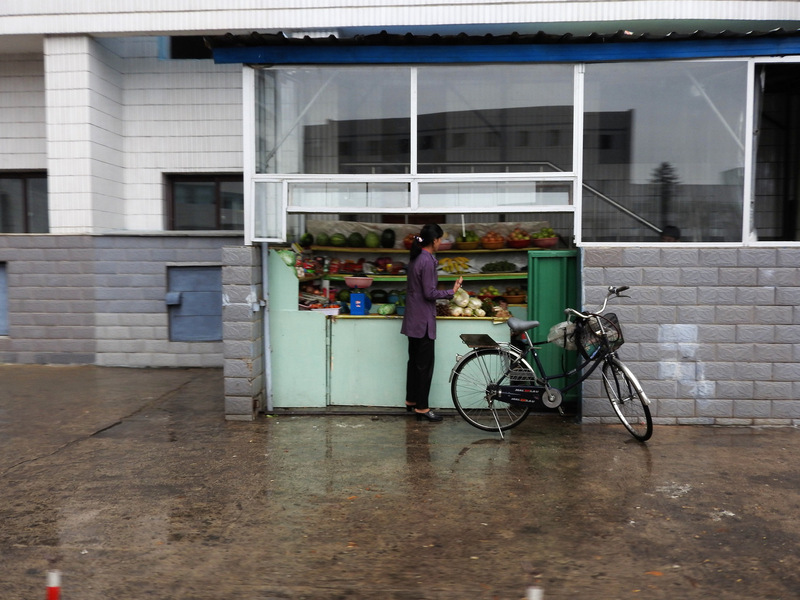 Fruit stand seen in Pyongyang. Small stands this size also sell snack food, sweets, water, sodas, beer, and ice cream. 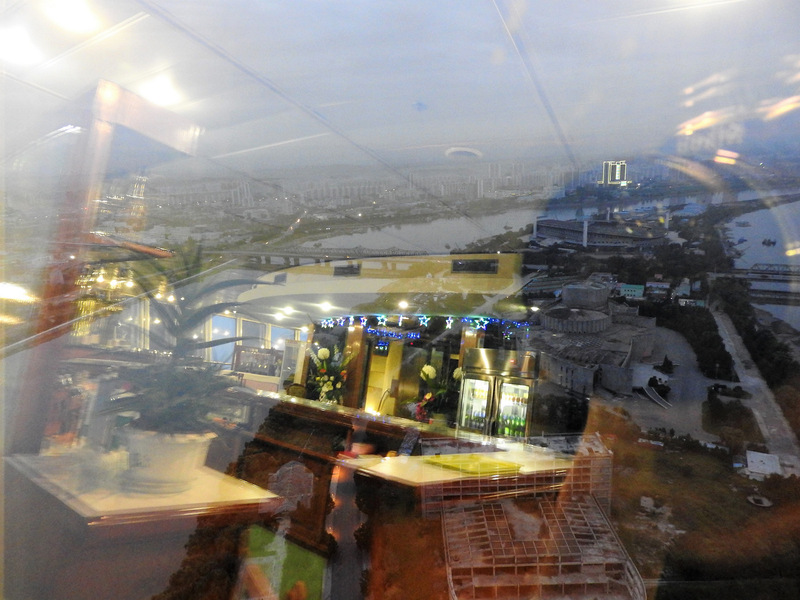 A revolving bar and restaurant at the top of Yanggakdo Hotel overlooks a modern, rebuilt city. 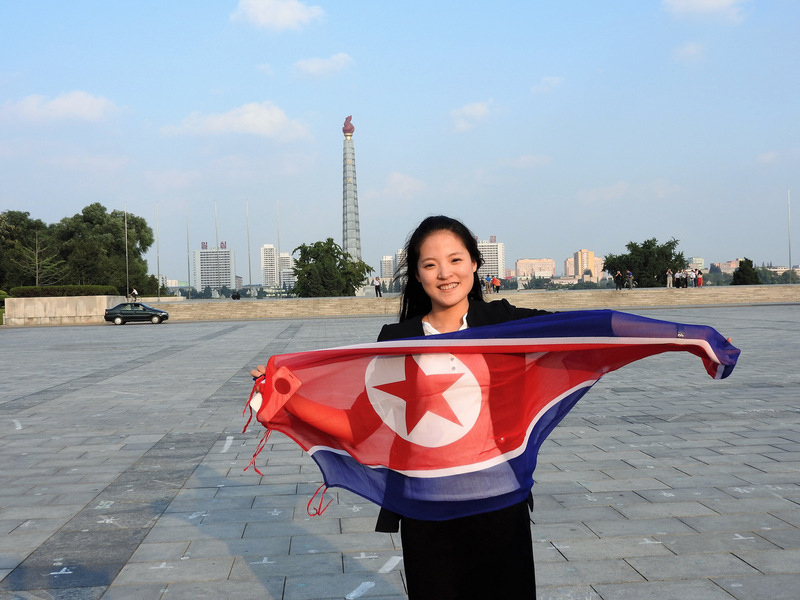 The DPRK receives tourists from around the world — especially China and Japan, but also South Koreans — and is continually opening up areas for tourism. The potential for more American tourism was recently stymied with the September 1, 2017 U.S. travel ban. 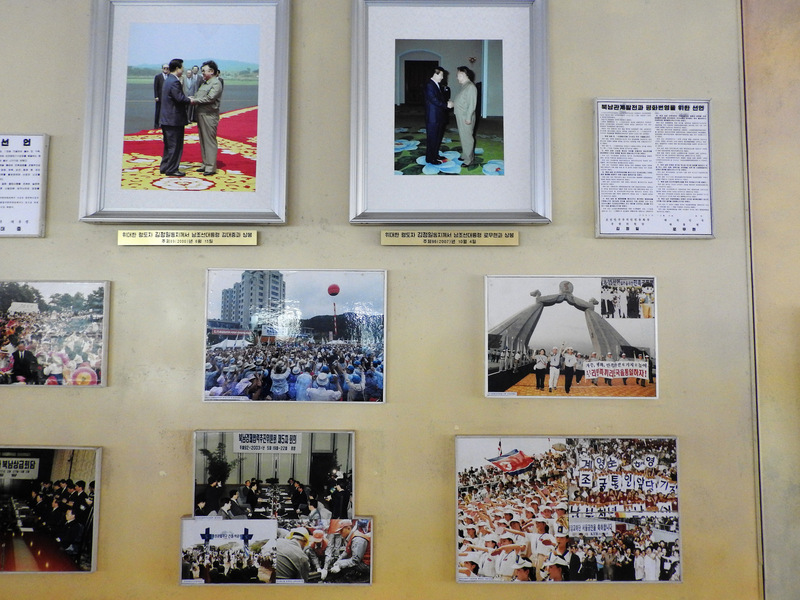 This is something former U.S. President Jimmy Carter, who has visited the DPRK three times, confirmed — saying he had met with Kim Il-Sung in 1994 “in a time of crisis, when he agreed to put all their nuclear programs under strict supervision of the International Atomic Energy Agency and to seek mutual agreement with the United States on a permanent peace treaty, to have summit talks with the President of South Korea.” Carter maintained Kim Jong-Il pledged he would honor these promises. 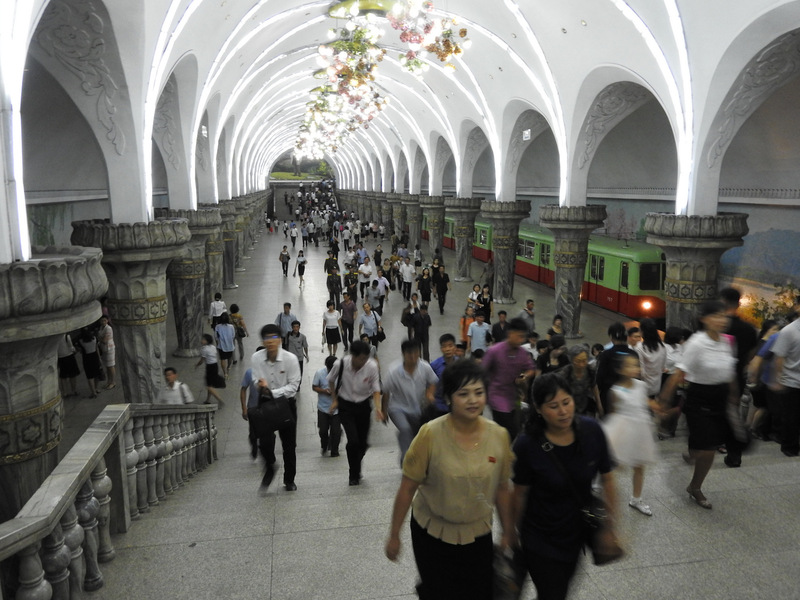 Pyongyang’s metro is a three-minute escalator ride below ground into a series of marble stations with elaborate chandeliers and beautiful wall paintings. Passengers ranged from well-dressed people, women in nice dresses and high heels, and others in casual blouses and slacks. Mosaics and engravings depict scenes of farming, construction, factories, rebuilding. Riding the metro costs the equivalent of a few cents. The tour group, Uri Tours, writes that half a million people ride the subway daily. Watch a clip of the metro here. Eva Bartlett is a Canadian activist/freelance journalistst.